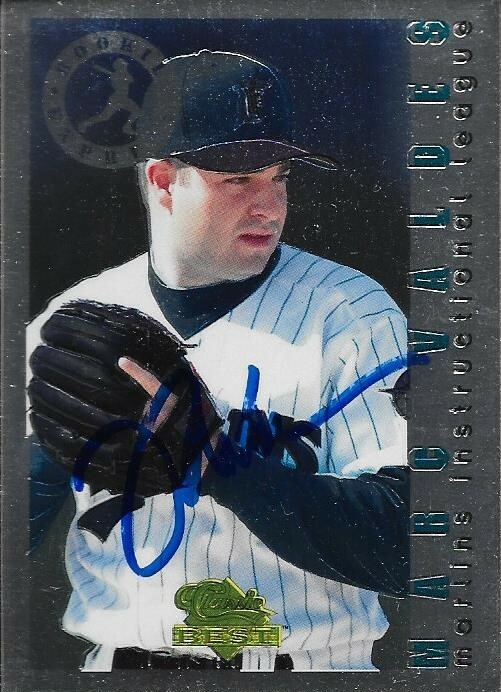 I held onto these Marc Valdes cards for a long time before I finally got around to sending off to him via the St. Lucie Mets. I had a bunch of guys who coached in the minors set aside, and finally got around to clearing out a bunch of them recently. Funny thing is, a lot of them came back at the same time. This Classic Best is the card that I really wanted to see signed, but the scan didn't turn out all too well. This is very similar to Chrome, except that the card is a lot thinner. I powdered it, and the signature turned out really well. I thought it was funny that I was able to get three different Topps years of prospects cards with Valdes on them. This is a 1996, a very rare set in my binder. 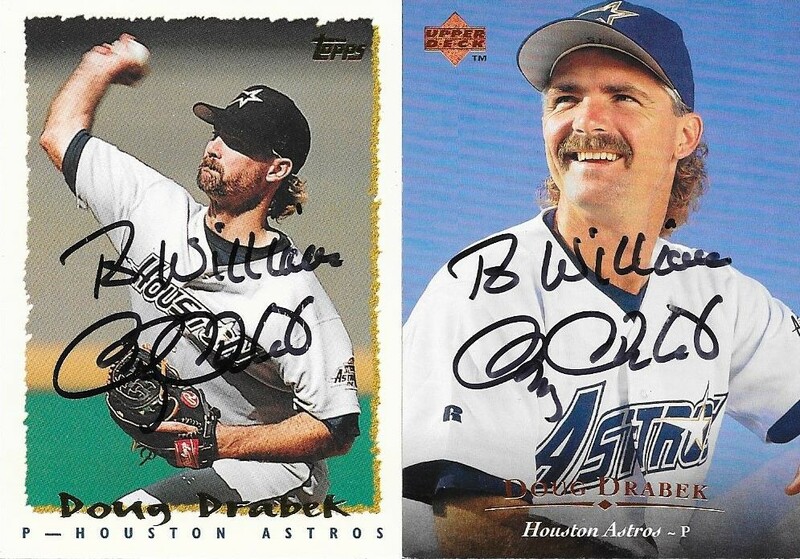 I also had his 1994 and 1995 Topps cards. I didn't even realize until just now that the 1994 is a Topps Gold parallel. 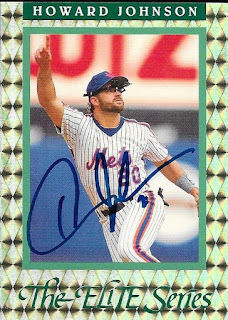 I need to take it off of my ledger for 1994 Topps, since I don't count gold parallels (or any parallels) toward the number I have of each set. I guess I need to remember that for when I get home. Valdes (b. 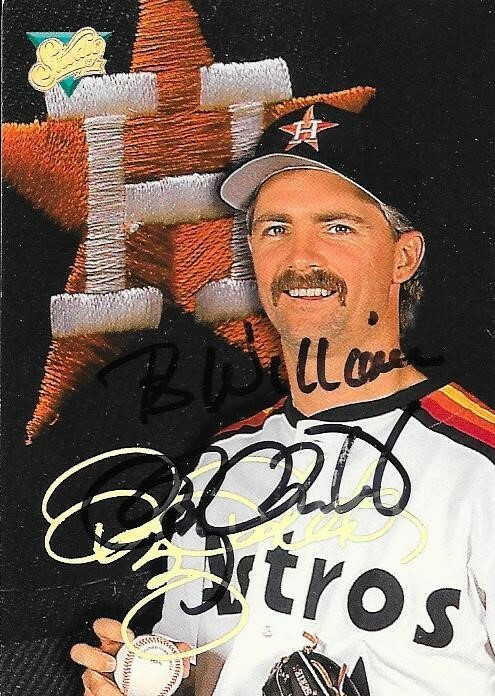 1971) played in the majors from 1995 to 1998, 2000 and 2001 for the Marlins, Expos, Astros and Braves. He had a career record of 12-15 with 135 strike outs and a 4.95 ERA. He was a first round pick by the Marlins in 1993 (27th overall). I mailed to Valdes via the St. Lucie Mets on May 8 and got the cards back on May 22, for a 14-day TAT. 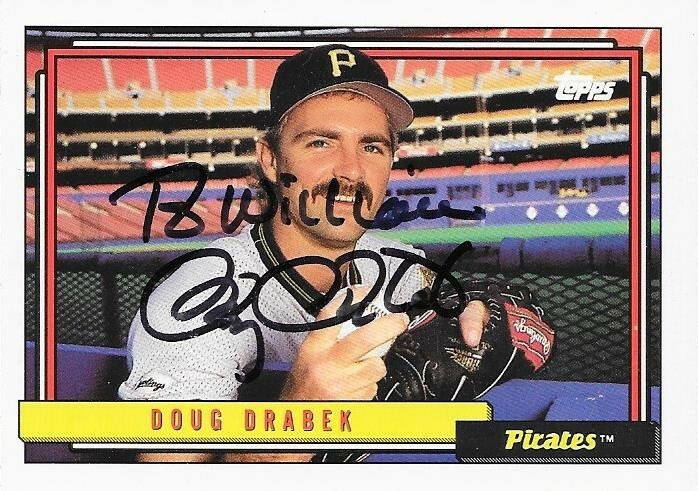 I waited and waited before I finally mailed to Doug Drabek for a TTM request. I had seen that folks had gotten him, but drug my feet in sending to him. I waited until the season began and sent to him via the Jackson Generals. This 1993 Studio turned out great, even though the card is really dark. He inscribed each card, and they all turned out nice. 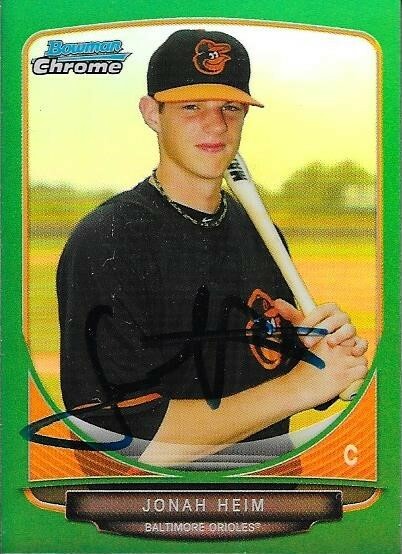 I wish I had a card of him as an Oriole, but I'm still glad I was able to get what I had signed. 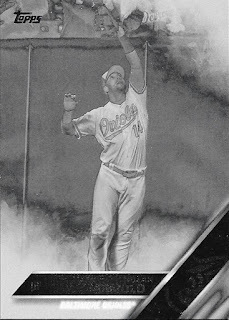 This 1992 Topps turned out really cool. I had to send off one of his horizontal cards, and it looks great. 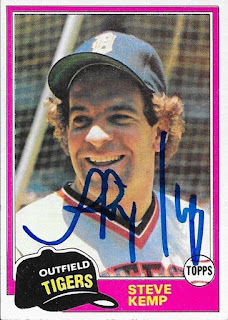 Finally, I got a 1987 Topps signed. I have over 50 signed 1987 Topps now, and show no signs of slowing down on them. I'm not pursuing the whole set, but it would be cool to get as many as I can. Drabek (b. 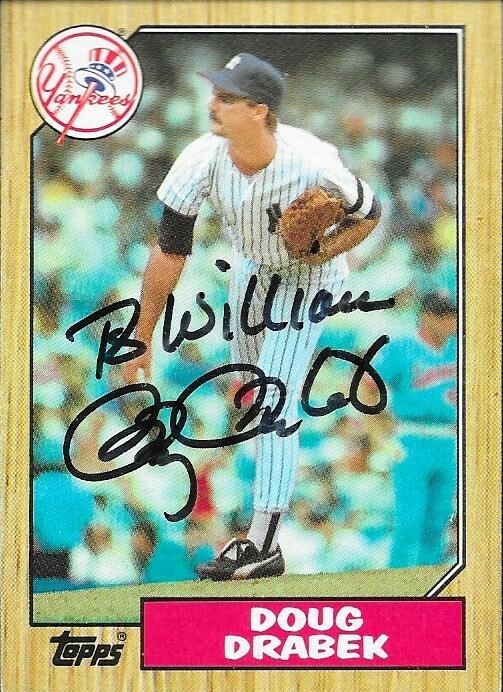 1962) played in the majors from 1986 to 1998 for the Yankees, Pirates, Astros, White Sox and Orioles. He had a career record of 155-134 with 1,594 strike outs and a 3.73 ERA. He was the 1990 NL Cy Young Award winner. He also finished 8th in the NL MVP voting that year. He also was an All Star in 1994. 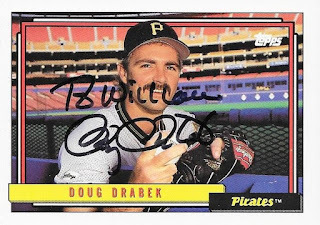 I mailed to Drabek on May 12 and got the cards back on May 22, for a 10-day TAT. 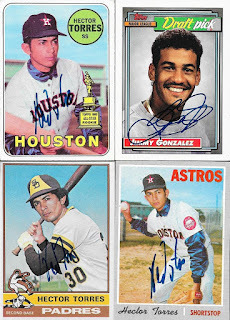 Here is another TTM success with some early to mid 1970s cards. This 1973 Topps Jack Brohamer has a cool action shot on it and looks really nice when signed. This is another card that I picked up earlier this month while I was in Columbia. 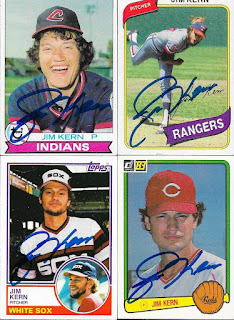 I also got these, including a 1976 Topps Traded, a 1978 Topps, 1980 Topps and a 1981 Topps. They all look really cool. Brohamer (b. 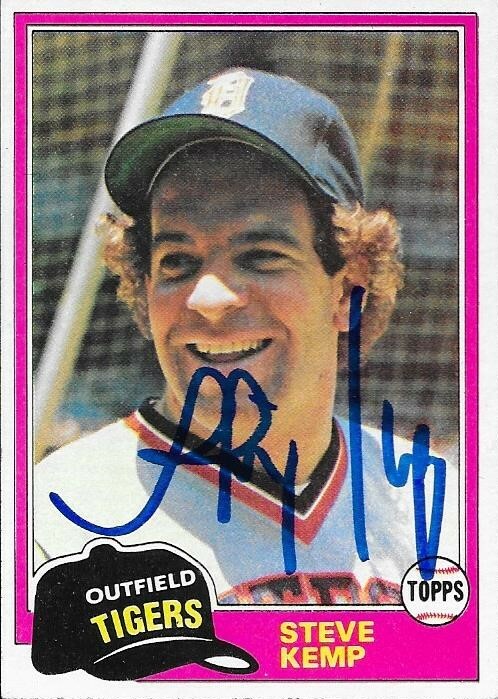 1950) played in the majors from 1972 to 1980 for the Indians, White Sox and Red Sox. He had 613 hits, 30 home runs and a .245 batting average. 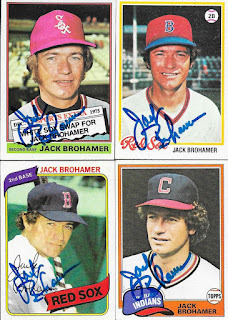 I mailed to Brohamer on May 8 and got the cards back on May 19, for an 11-day TAT. 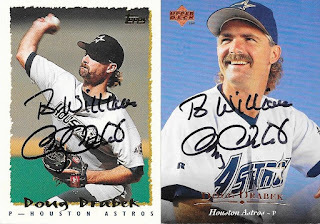 Here is a cool TTM success from the days of wild hair in the majors. 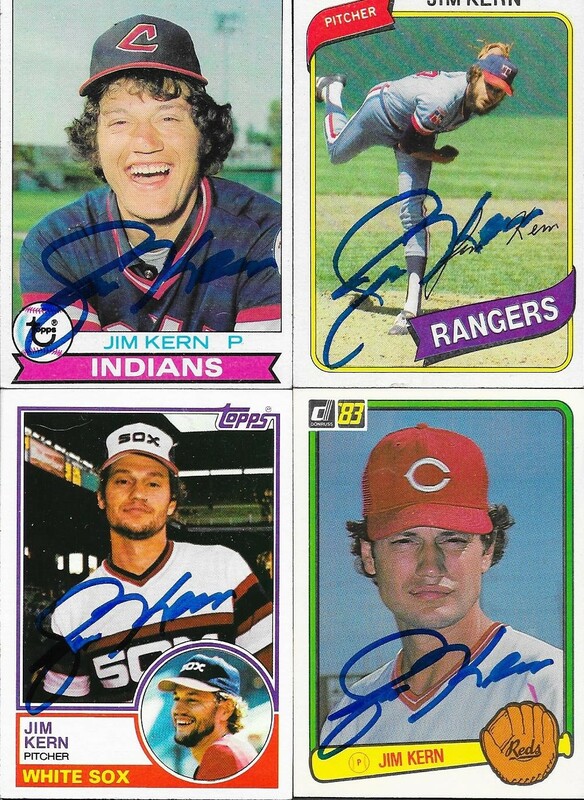 This success from Jim Kern was pretty cool, especially with the above 1982 Topps. I just love how sharp the card looks after it was scanned. 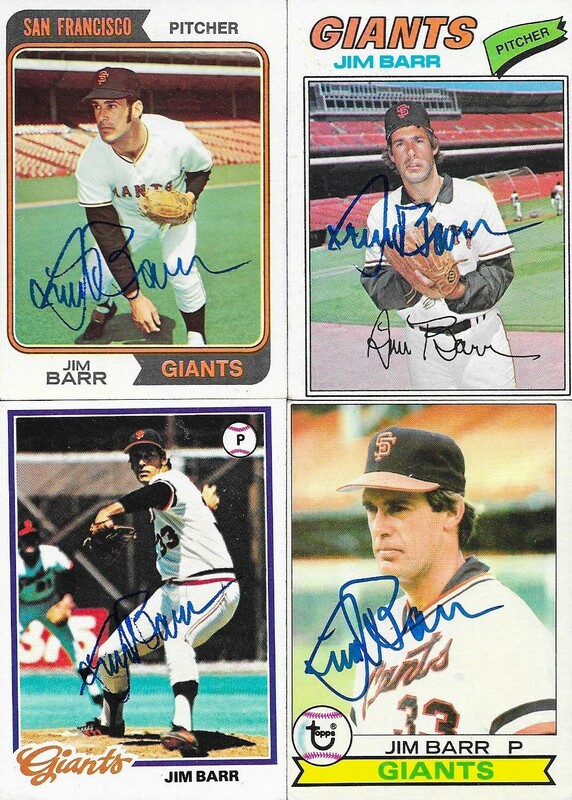 I also added these four cards to my autograph album. 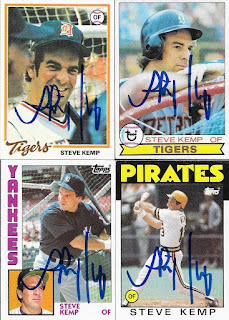 Topps cards from 1979, 1980 and 1983. I also added the 1983 Donruss. Kern (b. 1949) played in the majors from 1974 to 1986 for the Indians, Rangers, Reds, White Sox, Phillies and Brewers. He had a career record of 53-57 with an ERA of 3.32 and 651 strike outs. He was an All Star three times (1977, 1978 and 1979). His best finish in the AL Cy Young Award voting was 4th in 1979 when he went 13-5 with 29 saves and a 1.57 ERA. He also finished 11th in the AL MVP voting that season, his only time appearing on the MVP ballot. He was also the 1979 AL Rolaids Relief Award winner. I mailed to Kern on Febuart 21 and got the cards back on May 19, for an 87-day TAT. My post the other day about the recent Nolan Reimold pickups that came in was written the night before while I was hanging out at my parents' farm. I had the post scheduled to post the next day for two reasons, one was because the internet connection out there sucked and the other was because I knew I would be spending most of the day driving home. While I was driving home, my friend, Ryan, texted me and told me that Nolan had announced his retirement. I had an idea it was coming, especially since Nolan wasn't picked up by any MLB organization this past offseason. He was playing with the Long Island Ducks in the Independent League, and finally decided to call it a career. His wife, Jenny, posted a really nice Facebook post saying that he's not completely done, but it taking some time off to be with his family for the summer and then weigh his options. I'll always be a huge Nolan Reimold fan. Every time I met him, he was super nice to me. I hope that I am able to keep in touch with him in the future. My ultimate hope, if his playing days are truly over, is that he remains in the O's system coaching one of the minor league teams. I'm not sure if he wants to get into coaching, but I think he would be really good at it. He got a lot of crap from some of the so-called Orioles fans. 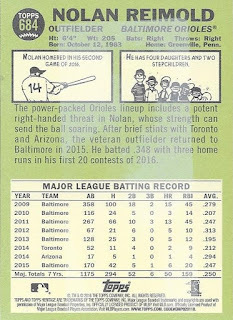 Those folks seem to forget how Nolan gave it his all on the field, and even broke his neck diving for a foul ball for the team. He was a fun player to watch, and I will definitely miss seeing him play. At one point, Nolan read this blog. If he still does, I would hope he sees this and knows that there are true Oriole fans out there who will always look back on his career fondly and will remember his contributions to the team. 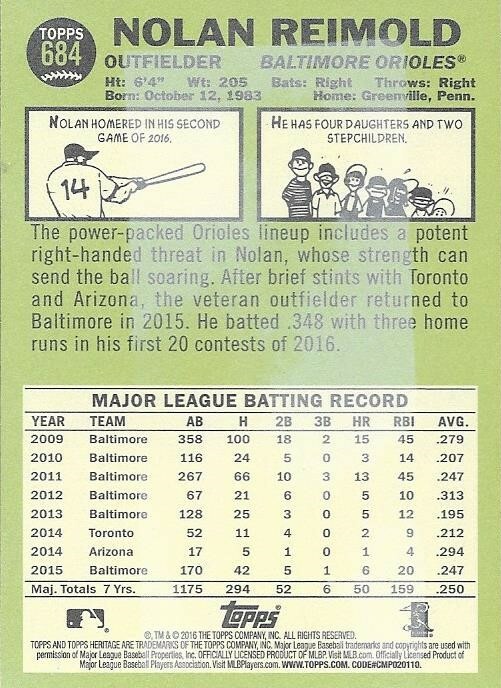 Enjoy your time with your family, Nolan, you have earned it. I hope I can see you again, someday! 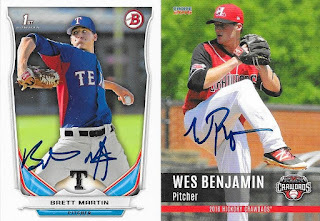 I had a wave of TTM successes come in while I was away at Andrew's. 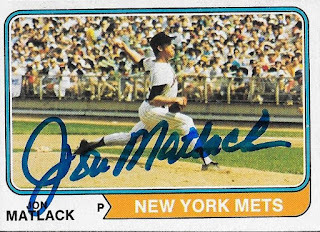 I love having some variety when I do my TTM posts, but for whatever reason, most of the cards that came back were early 70s cards. 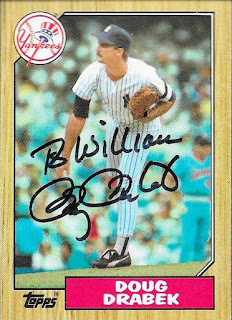 I think it was because the batch I sent out at the time was from my trip to Columbia, and most of the cards were from that era. It is interesting sometimes how certain groups of cards come back quickly, and others take a while and get mixed in with the rest. 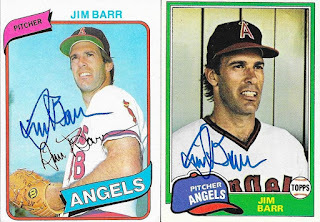 I was happy to get this return from Jim Barr, though, because I had a few of his cards sitting in my box for a while. 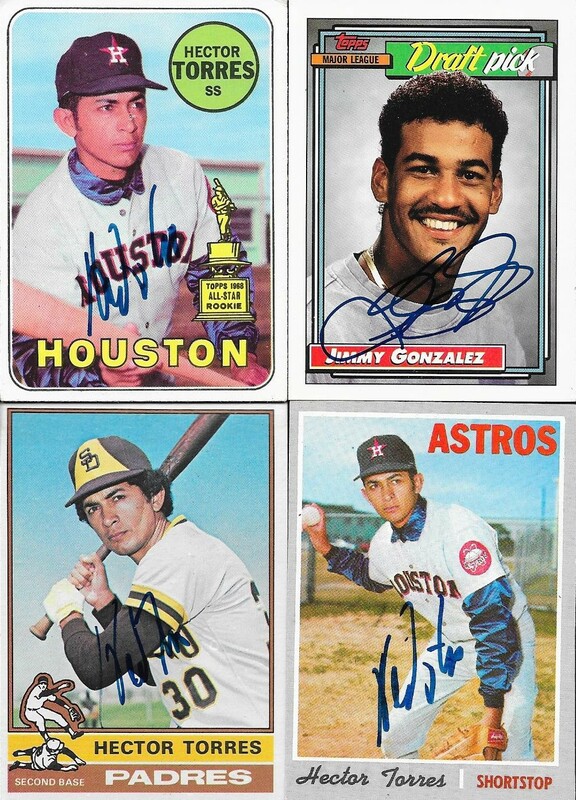 I polished off the request with a couple from Columbia, mainly the above 1973 Topps. I got a nice assortment of 70s Topps in the success from Barr. 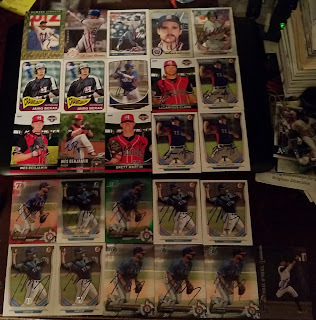 Most of them came out of boxes from the Columbia shop at different points in my adventures, but a few of them also came from the February card show. Looking at the cards, a bunch of them are empty stadium shots, which is interesting. Lots of pregame practice going on, I suppose. Finally, here are two 1980s cards, one from 1980 and the other a 1981. All of the cards turned out great, I think. Barr (b. 1948) played in the majors from 1971 to 1980, 1982 and 1983 for the Giants and Angels. He had a career record of 101-112 with 741 strike outs and a 3.56 ERA. 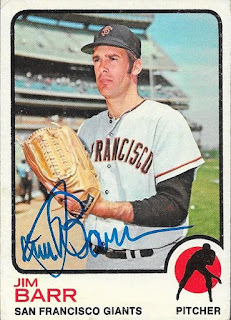 I saw while looking him up, he was drafted 6 times between 1966 and 1970 in different phases of the draft. He must have been a really sought after prospect. 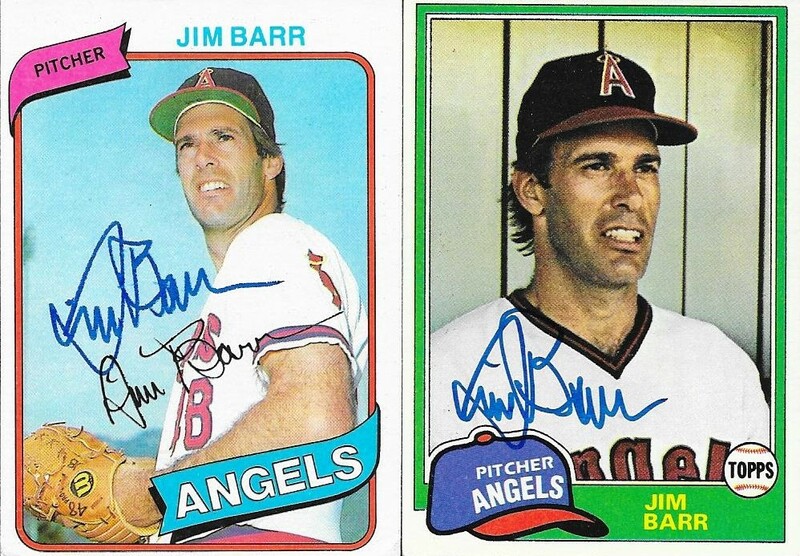 I mailed to Barr on May 10 and got the cards back on May 19, for a 9-day TAT. I'm getting more and more comfortable graphing at Grainger Stadium. So much so, I brought a friend from work to the game with me last Thursday and wasn't embarrassed that she was able to see me in action. I had accepted several 50/50s and with some events upcoming, I wanted to make sure I was able to get the Ducks as soon as I could. They are also on a long road trip now, so Thursday would be my last chance for a while to get some cards done. 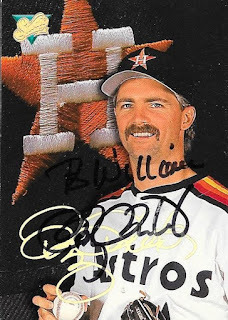 I had bought this 1992 Donruss Elite Howard Johnson off of EBay for around $8.00. I have the Cal Ripken auto from that set, but I saw the Johnson and figured that would be a cool card to get signed. He usually signs only one or two cards, but this time around, he signed all 4 cards I had on my page. The other three were part of a 50/50 for my friend, Gerard. I will post the cards I get to keep from the 50/50, once I complete all of the cards he sent, and we decide on who keeps what. This card is numbered 9,136/10,000. That is pretty high numbering these days, but back then, everyone was excited that it was serial numbered. I wasn't 100% sure I was going to the game until the night before, so I thrashed looking for Mudcats cards that night. 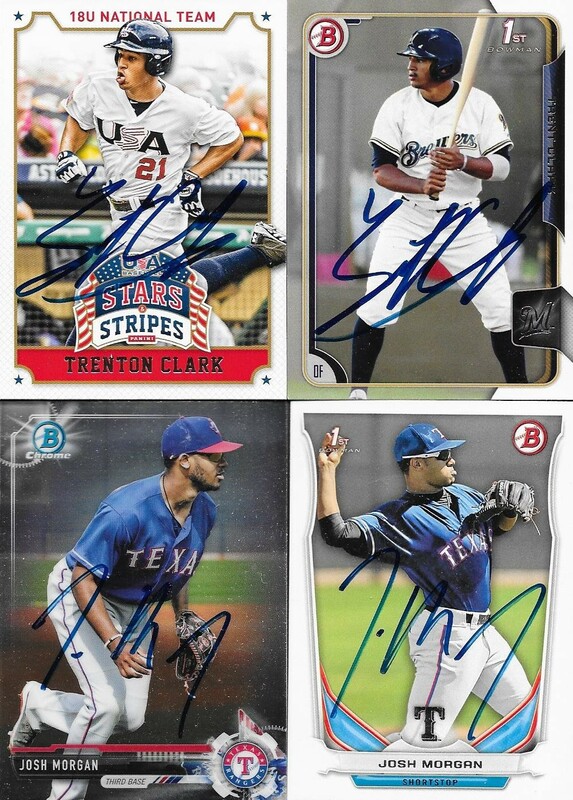 Surprisingly, I found a ton of cards, and did pretty well getting a lot of them signed. I had two each of Isan Diaz and Jake Gatewood, and they took care of all of them. Same goes for Kodi Medeiros and Freddy Peralta. I was surprised I was able to get Peralta, since he was the starting pitcher that day. 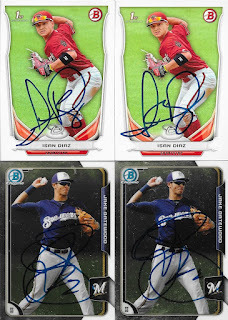 Trent Clark only signed two of the 4 cards that I had, but that isn't a big deal, because I can go to Zebulon and see the Mudcats again. That way, I'll still have some cards I can take along. 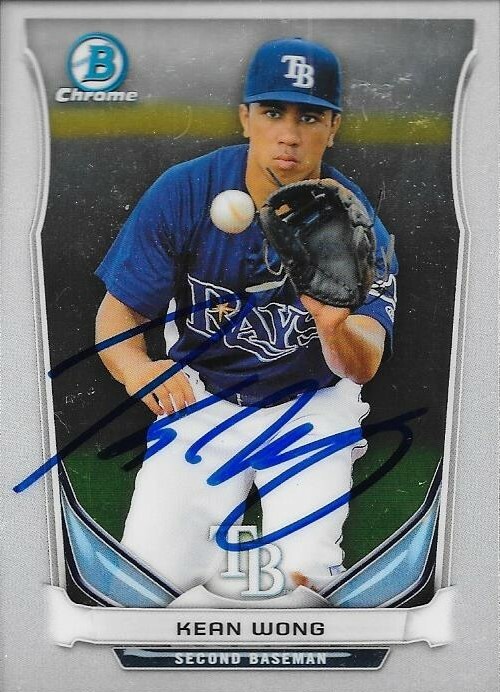 I also got a 2017 Bowman Chrome signed for Andrew. We pulled a couple of them while I was visiting him last week. 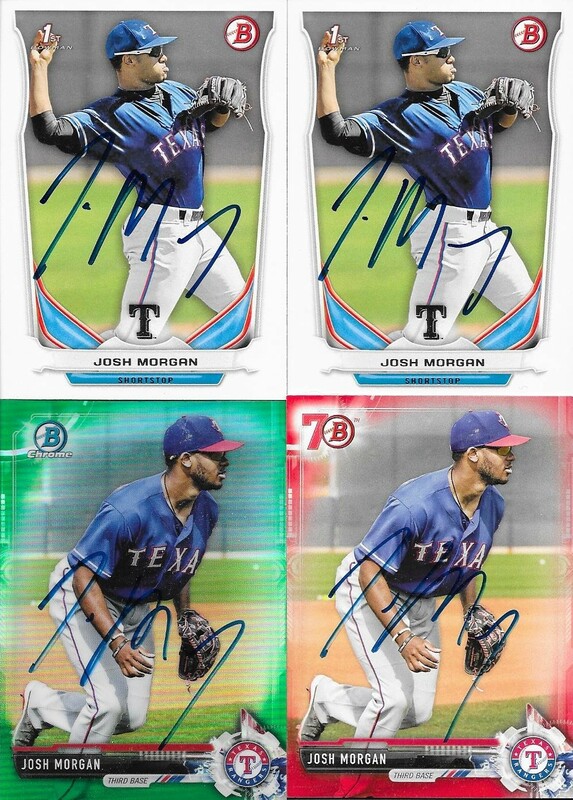 My friend, Angela, actually got the two Josh Morgan 2014 Bowman signed for me after the game. He was really nice, as always, and signed twice for me. 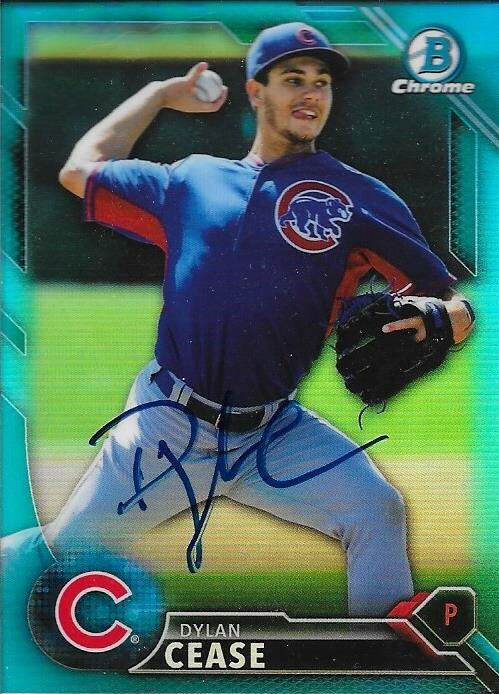 The 2017 Bowman green chrome parallel is numbered 72/99. The red isn't numbered. I still had some of the Hickory Crawdads team set that I could get signed, so I was able to get this Wes Benjamin taken care of. I also saw Brett Martin for the first time in a while. He is just about ready to come back from the DL. He stood and talked to me for a while and signed my cards. I had also accepted a 50/50 from a kid named Alex in New Jersey. 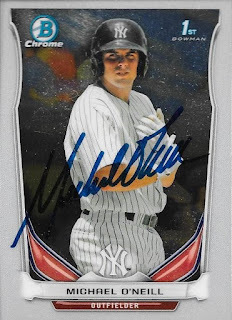 He wanted a Tampa Yankees Mike O'Neill signed for his set, and gave me two 2014 Chrome O'Neills. I got one of the two Chromes signed, and can get the other next time I go. I also was able to get Brewers prospect Corey Ray to sign a baseball (Official Carolina League) after the game. He had said he would sign after he stretched, but we ended up having to wait until after the game. Here are all of the autographs I got from the Mudcats, which isn't too bad, considering that I thrashed the night before to get cards together. 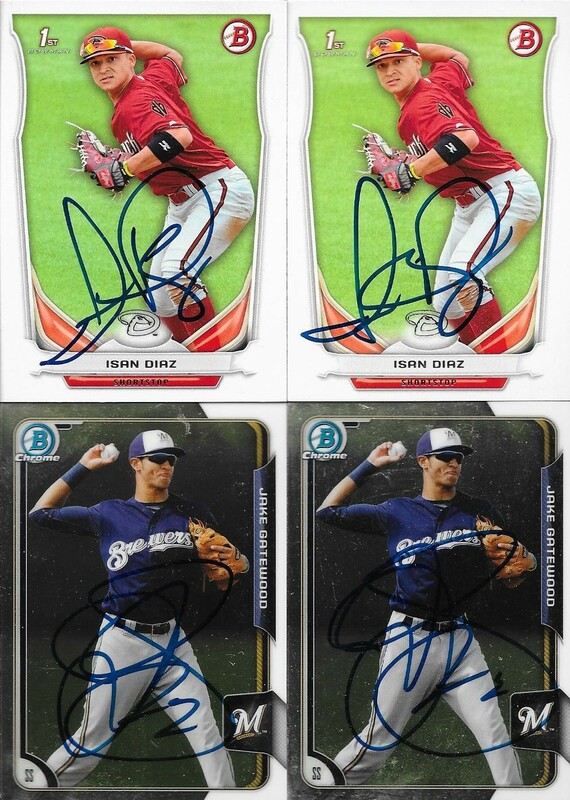 These are all of the Wood Ducks autos that I got. The O'Neill for the 50/50 with Alex is at the bottom right corner. I also did 50/50s for Gerard, Andrew and Dugan. 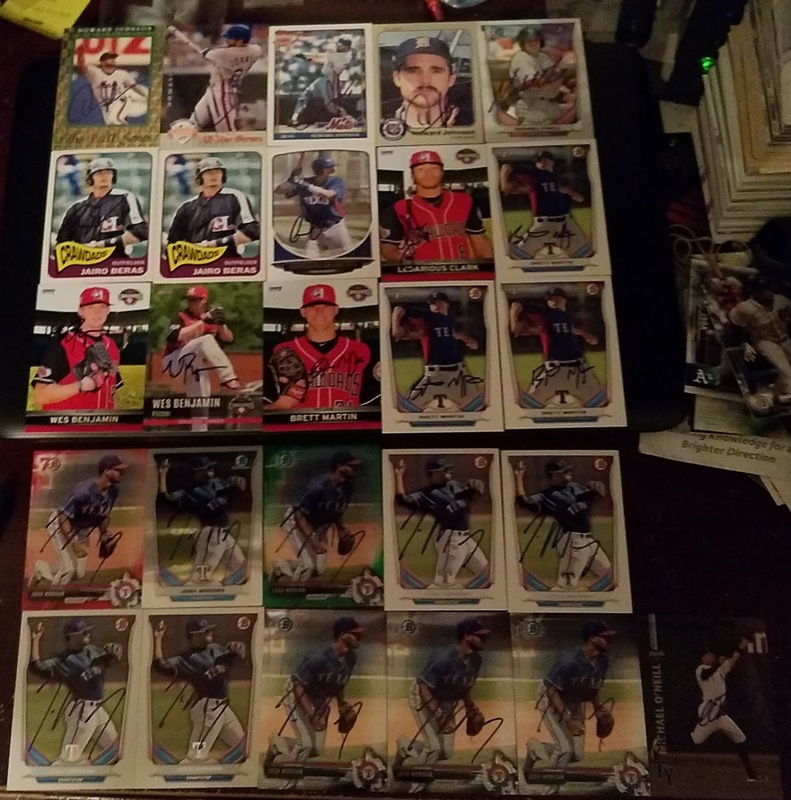 Dugan will get a Brett Martin 2014 Bowman, and a bunch of Crawdads team cards. 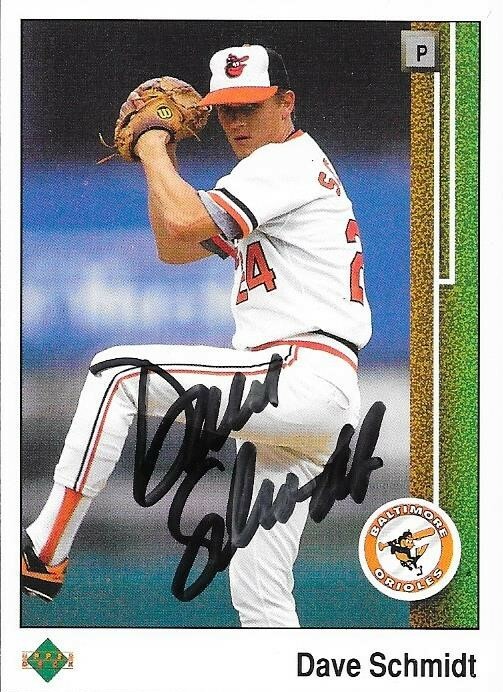 I was able to add a former Oriole to my autograph album with this success from Dave Schmidt. I hadb't gotten any 1989 Upper Deck signed yet, so it was nice to finally add one to the binder. I also added a few nice Topps cards, including a 1987 Topps. 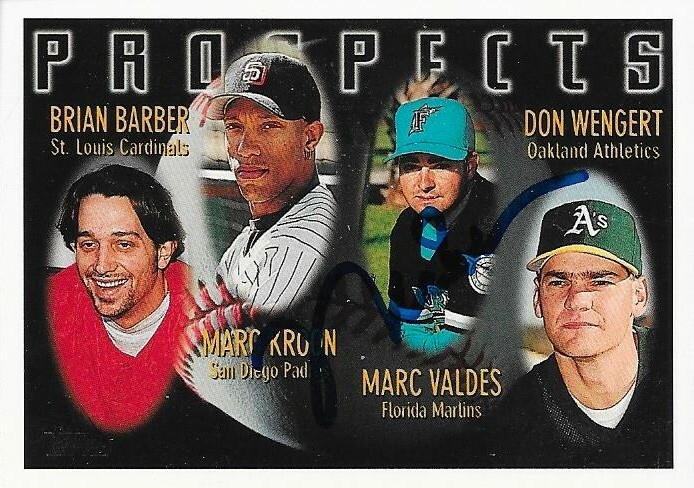 I also got a Donruss Diamond Kings signed, and those always look great. Schmidt (b. 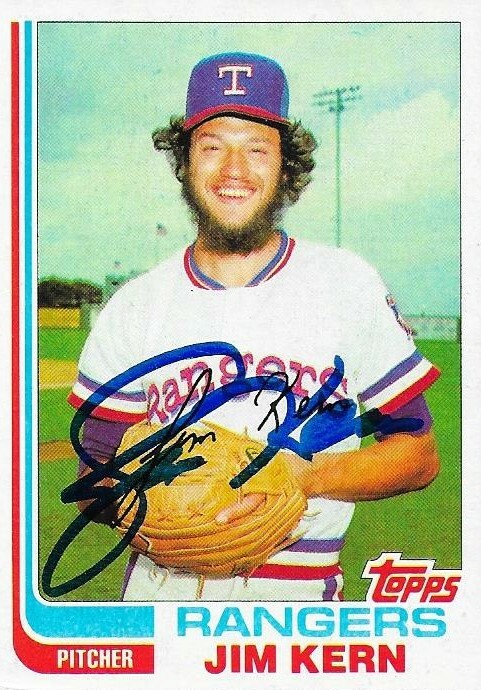 1957) played in the majors from 1981 to 1992 for the Rangers, White Sox, Orioles, Expos and Mariners. He had a career record of 54-55 with an ERA of 3.88 and 479 strike outs. 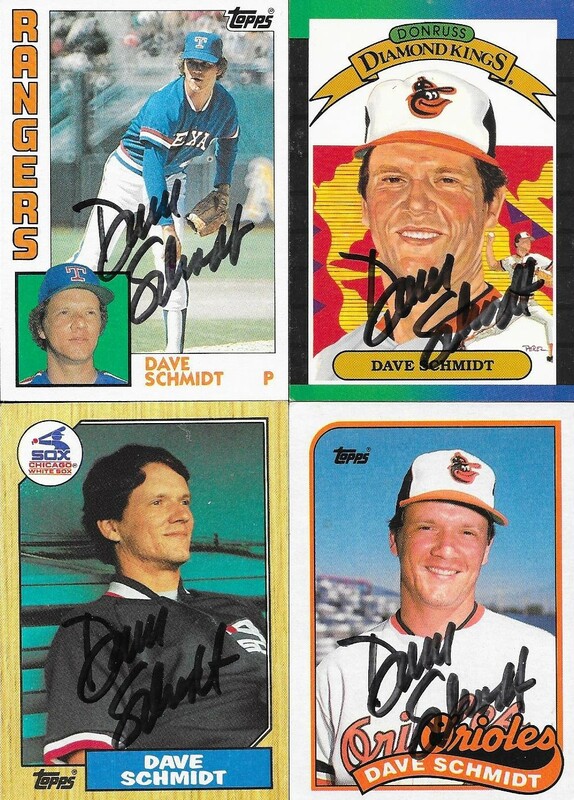 I mailed to Schmidt on February 6 and got the cards back on May 18, for a 101-day TAT. 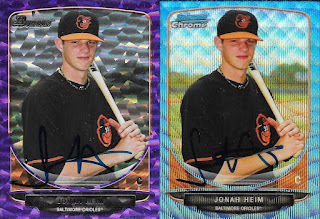 I picked up a couple Nolan Reimold parallels recently that I had my eye on for a while. I finally got the negative parallel from 2016 Topps, and got it for a really good price. I also got this "gum stain" parallel from 2016 Heritage. 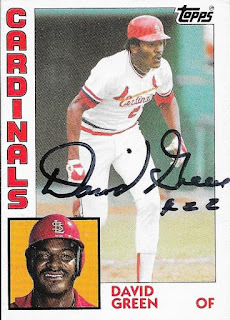 This is kind of funny to me, back in the day, you would get upset if your card had the gum stain on it, but nowadays, it is a short print that is sought after. What is wrong with us? Still, it is pretty cool. 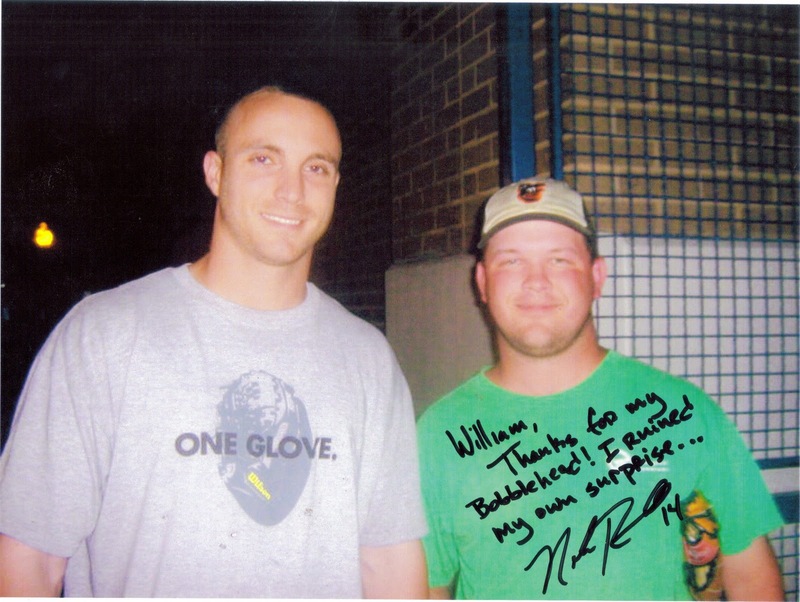 Nolan is currently playing independent ball with the Long Island Ducks. I really hope he can make his way back to the majors. He's a great guy with an amazing family, and I only want to see him succeed. I have been slowly knocking out TTM subjects who charge fees, so I can conserve money. 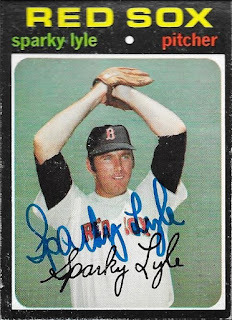 I sent off to Sparky Lyle, who charges $5.00/card and got some nice early 70s taken care of and added two other cards as well. 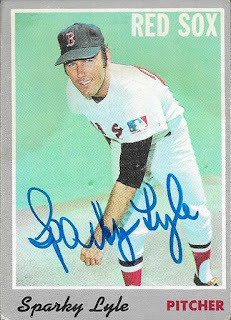 I had been holding onto this 1970 Topps for some time, hoping I could get it signed, and finally got it taken care of. His signature is pretty nice. 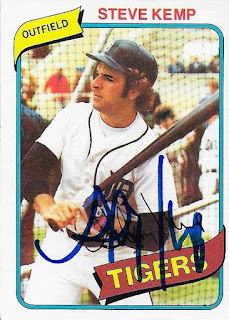 This 1971 Topps also turned out really well. I haven't gotten one of them back in a while, so this one was a nice addition. Lyle (b. 1944) played in the majors from 1967 to 1982 for the Red Sox, Yankees, Rangers, Phillies and White Sox. He had a career record of 99-76 with 873 strike outs and an ERA of 2.88. 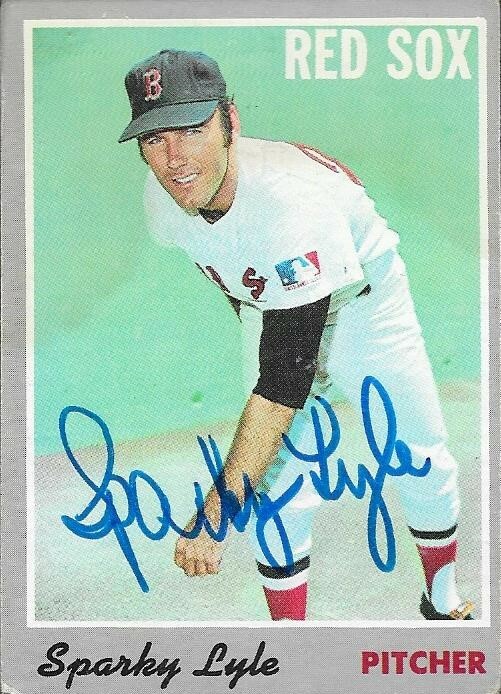 He was a 3-time All Star (1973, 1976 and 1977) and was the 1977 AL Cy Young Award Winner. He finished third in the 1972 AL MVP voting and won the World Series in 1977 with the Yankees. He appeared on the Hall of Fame ballot between 1988 and 1991 but only received a peak of 13.1% of the vote. 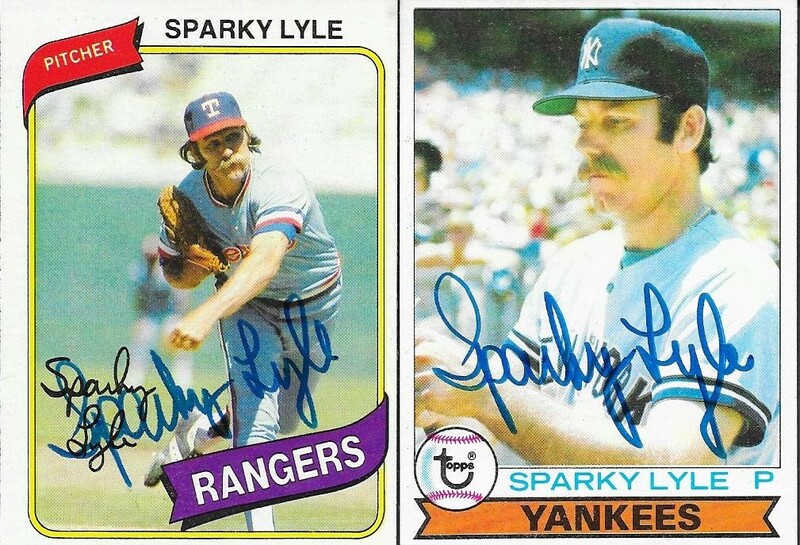 I mailed to Lyle on May 9 and got the cards back on May 18, for a 9-day TAT. 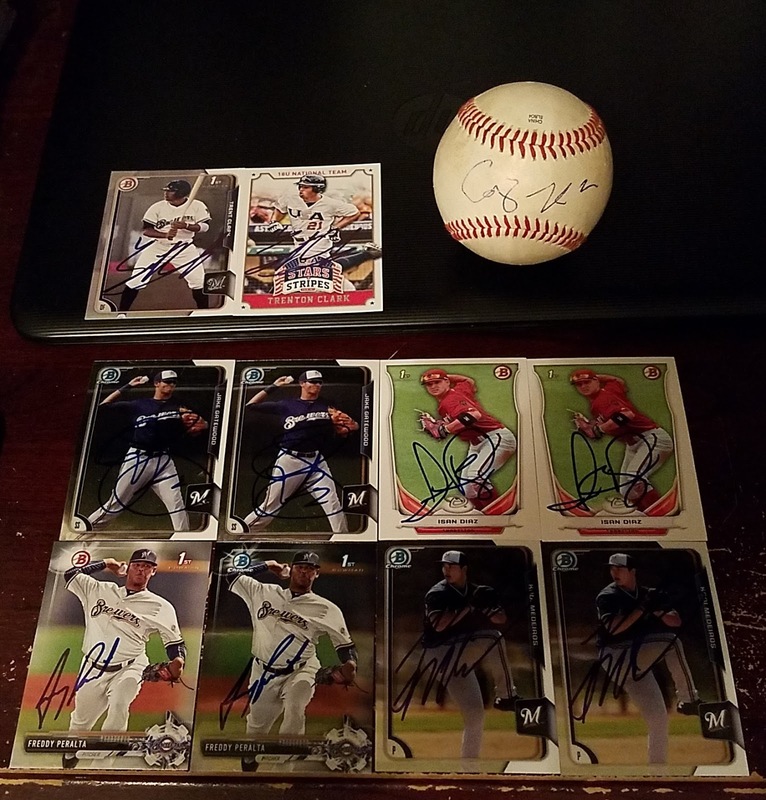 My good friend, Dugan, has been working on getting me some autos this season from some International League players, via the Durham Bulls. 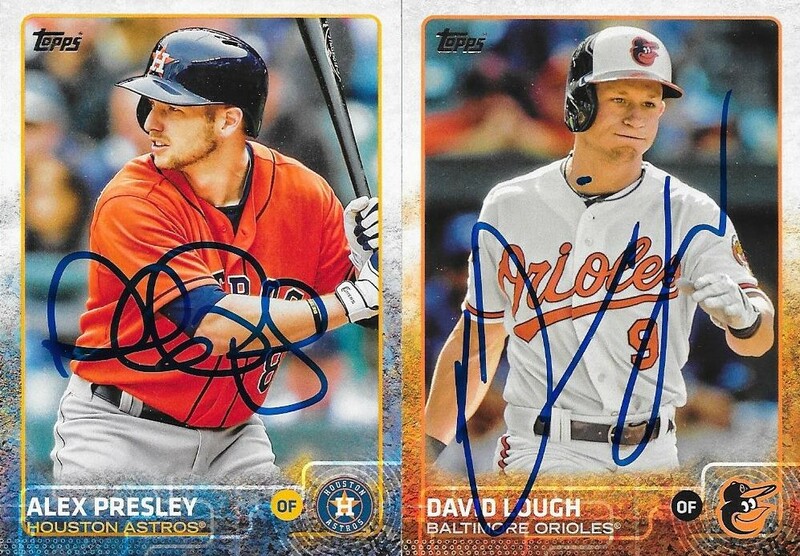 A batch came in the other day from Dugan that had three autographs for me. I honestly don't remember sending him this Kean Wong, but ok. It turned out great! 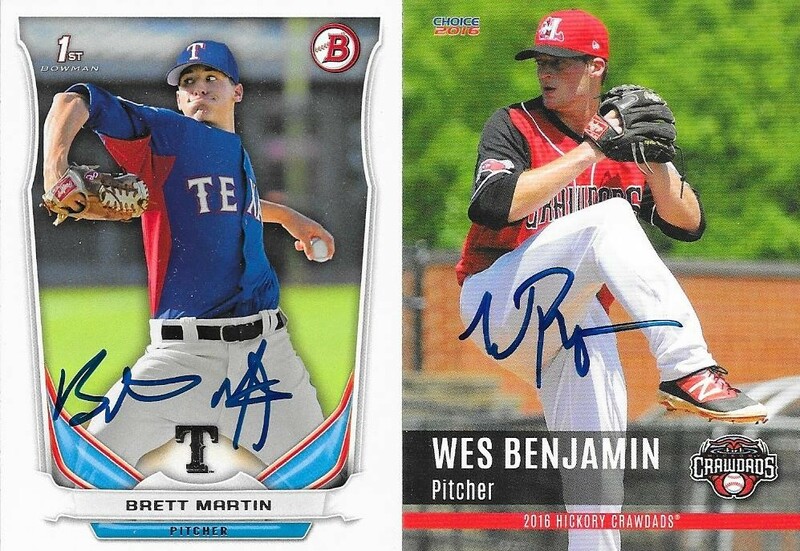 I also got these two 2015 Topps cards back. 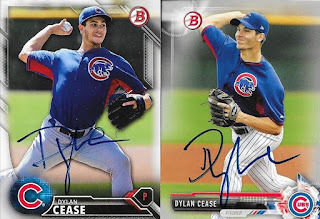 I only had a couple of them signed, so these help pump up my 2015 Topps numbers just a bit. The David Lough was actually sent to me by someone (I can't remember who sent it) that had a note to give it to my mom if I didn't need it. I think Mom will be ok if she sees that it will be going in my autograph album. Thanks so much for the autos, Dugan. I am currently working on a Hickory Crawdads team set via the Wood Ducks for him, so I'll be able to repay him soon. 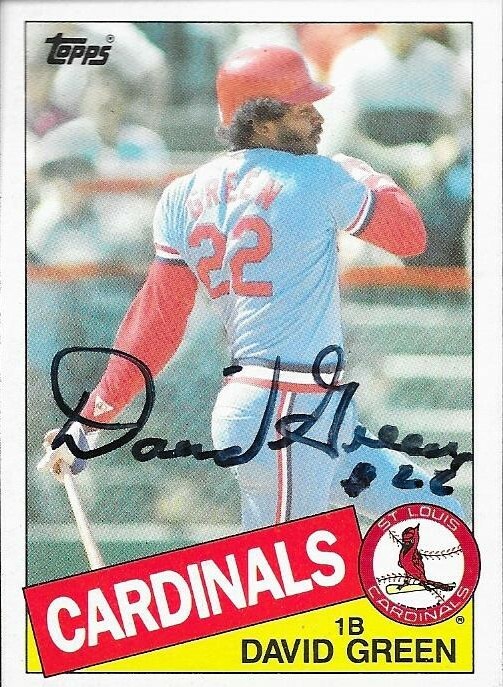 I got two nice cards back from former Cardinals outfielder, David Green with this TTM success. I sent off three cards, actually, and all three came back. I will put the extra card in a pile and do another giveaway sometime soon. 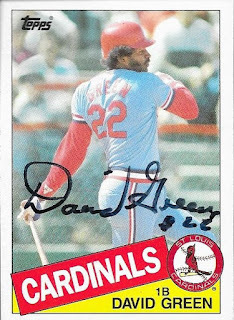 I liked the signatures on the cards; Green even inscribed his uniform number on both of them. Green (b. 1960) played in the majors from 1981 to 1985 and 1987 for the Cardinals and Giants. He had 374 hits, 31 home runs and a .268 batting average. 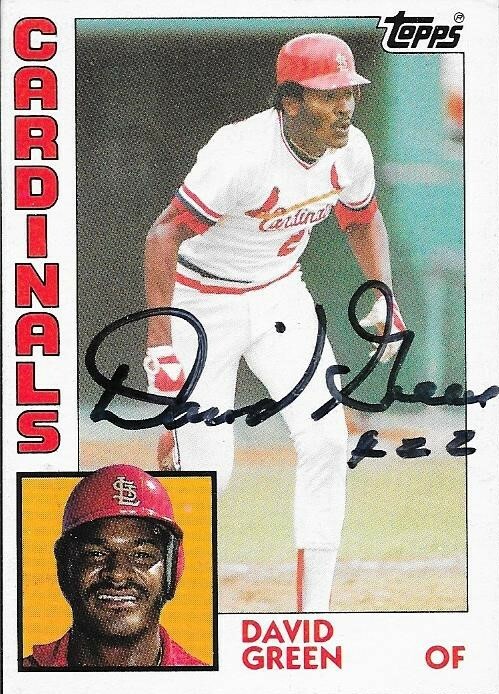 He won the World Series with the Cardinals in 1982. I mailed to Green on May 4 and got the cards back on May 17 for a 13-day TAT. 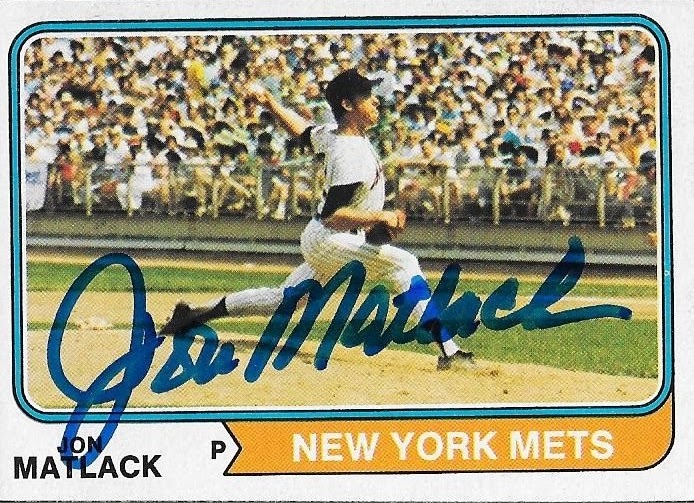 I was really excited to get this TTM success back from Jon Matlack solely based on the above 1974 Topps. This card is a beauty, and I really love how it turned out. This 1973 Topps that I picked up from Conrad of the former Columbia antique shop really turned out nice, as well. I met up with Conrad earlier this month when I was in Columbia for the Crawfish Festival and picked up an assortment of cards. I got a bunch, and am happy with what I have gotten back so far. 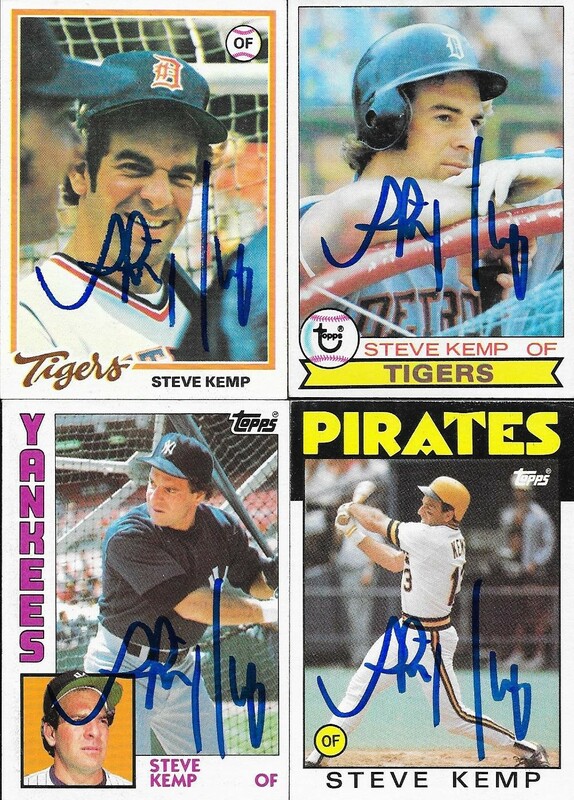 I also added a few other Topps cards from 1976, 1980, 1981 and 1982. 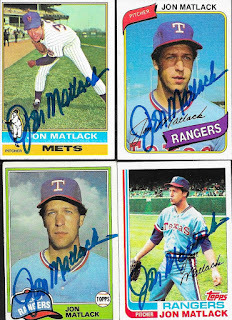 I believe I have a couple cards signed by Matlack from the National a few years back, but I'll have to check my album. 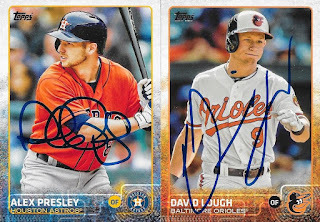 At some point, I need to make a spreadsheet of all of the signatures I have on cards, but that is a plan that is a long way off. Matlack (b. 1950) played in the majors from 1971 to 1983 for the Mets and Rangers. 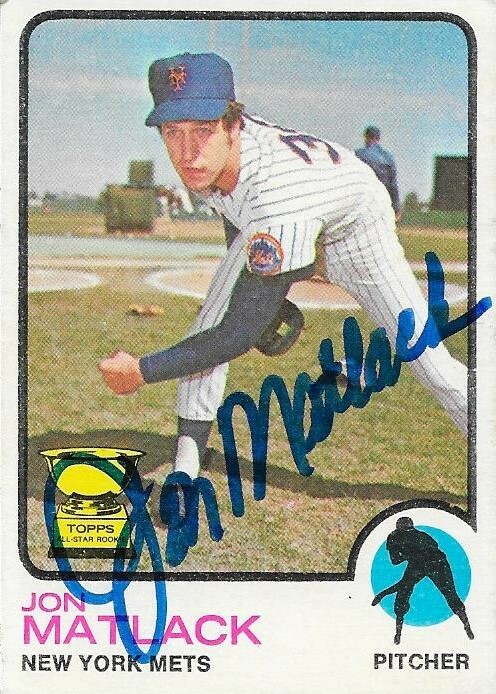 He had a career record of 125-126 with 1,516 strike outs and an ERA of 3.18. He was the NL Rookie of the Year in 1972. He was also a three-time All Star between 1974 and 1976. He appeared in the 1973 World Series while with the Mets and pitched to a record of 1-2 with a 2.16 ERA in the Mets' loss to the A's. 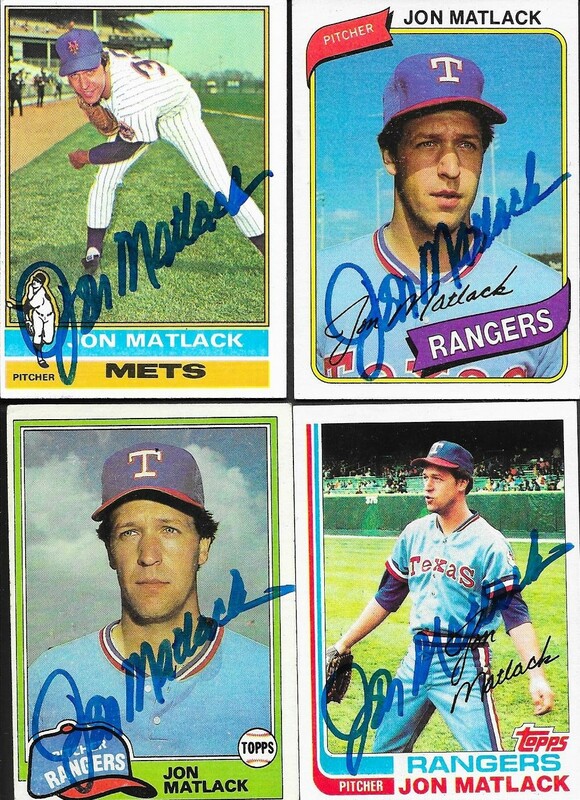 I mailed to Matlack on May 10 and got the cards back on May 17, for a 7-day TAT. I had 10 TTMs waiting on me when I got back from Andrew's, the first of which was this success from Steve Kemp. He signed a bunch of late 70s-early 80s cards for me. This 1980 Topps turned out really nice. I had a lot of Kemp's cards, and used the opportunity to add some more Topps cards to my binder. Kemp (b. 1954) played in the majors from 1977 to 1986 and 1988 for the Tigers, White Sox, Yankees, Pirates and Rangers. He had 1,128 hits, 130 home runs and a .278 batting average. 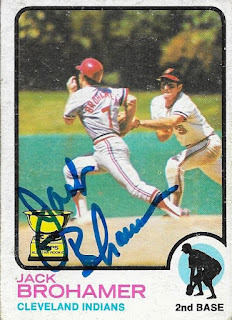 He was an All Star in 1979 and finished 17th in the 1979 AL MVP voting. I mailed to Kemp on May 8 and got the cards back on May 17, for a 9-day TAT. One of the things Andrew and I planned on doing while I was visiting him was to go to a Cardinals game, and also a minor league game in his area. The Bowming Green Hot Rods are the closest minor league team to him, so we were able to find a home game to attend while I was in town. We also were fortunate enough that the St. Louis Cardinals were also at home while I was there. One of the highlights of being able to see Bowling Green (the Single A team for the Tampa Bay Rays) was that I could finally meet Jonah Heim. 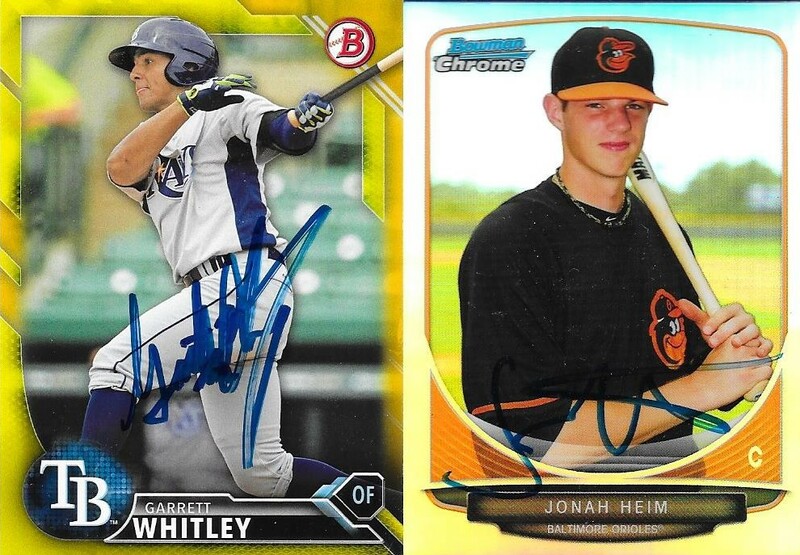 Heim was a former Orioles farmhand who was dealt to Tampa last year for Steve Pearce. 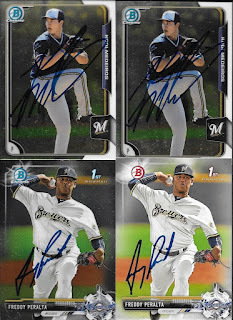 I had a bunch of Heim's cards, so I split them with Andrew, and we got all of them signed. I was especially happy about the 2013 Bowman Chrome green mini numbered 65/75. 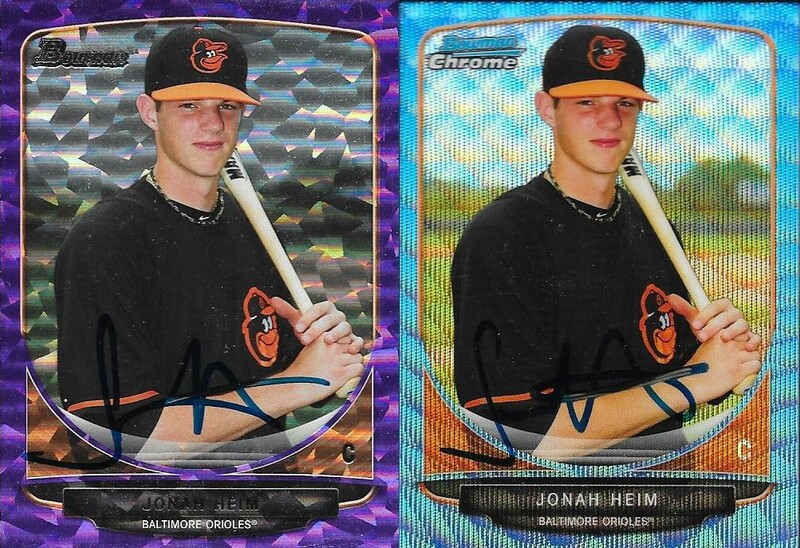 I also got the blue shimmer, purple ice and refractor signed. 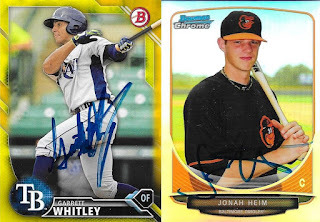 I bought some Garrett Whitley cards for the trip, and I also accepted a 50/50 from my good friend, Gerard, but Whitley only signed two cards for me. One of them was the above yellow parallel from 2016 Bowman, and a 2015 Bowman paper for Gerard. 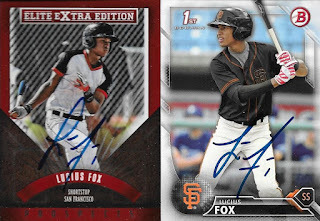 I got two cards signed by Lucius Fox. 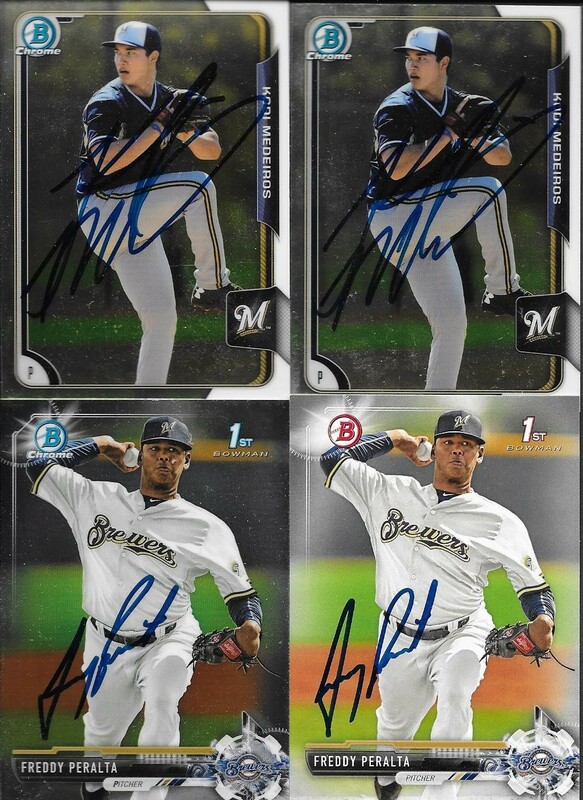 I had bought three Bowman Platinum, but he wouldn't sign them. He said that it wasn't him on the card, but how many Lucius Foxes are playing in the minors? 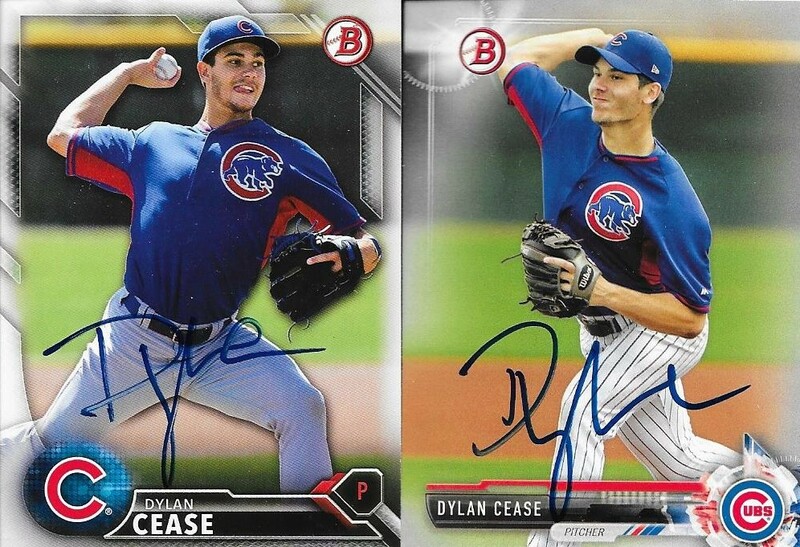 I also bought a bulk lot of Dylan Cease cards. 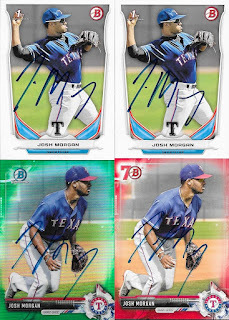 He was on the DL, but was gracious enough to sign for Andrew and I. I got a 2017 Bowman Chrome taken care of for Gerard, and the rest of the ones I had signed were from what I picked up. I really like how this blue parallel of Cease from 2016 Bowman Chrome turned out. I got it pretty cheaply off of Ebay specifically for the trip. Andrew is going to try to get the rest of the cards taken care of for me as the season progresses. I did really well with the coaches, too, with the exception for mistaking the Hot Rods manager for Hector Torres. Apparently there is about a 30-year age difference between the two, and the manager was happy to have a "serious discussion" (his words) with me. 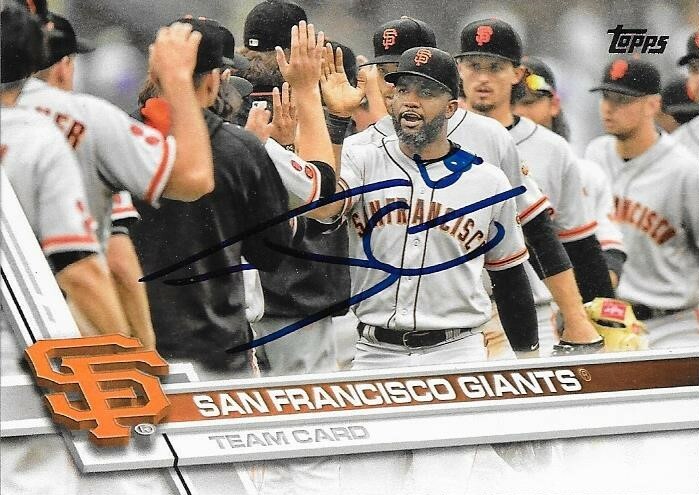 I'm going to have to get one of his cards and send it to him and have him inscribe it "I am not Hector Torres". That would be funny, and make my embarrassment worthwhile. 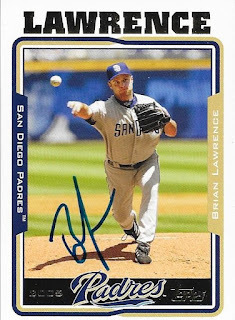 I dug through my mid-2000s Topps boxes at the last minute before I left for Andrew's, and found two Brian Lawrence cards. I gave one to Andrew, and got this 2005 Topps signed. I did have a little success at the Cardinals vs. Giants game the day before. 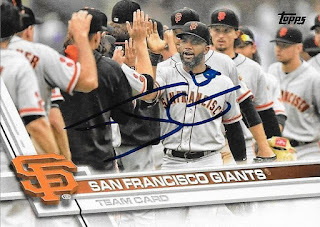 Andrew and I each got one of these 2017 Topps Giants team cards signed by Giants reliever, Josh Osich. It really is a crapshoot in being able to figure out which MLB players will sign, so I was happy that I brought along the random team card. I had a really great time at both ball parks. I now have been to 4 MLB parks (Baltimore, Pittsburgh, Detroit and St. Louis), and countless MiLB parks (I will update my map soon). I also had fun with Andrew, and hope I can get him down my way to graph the Wood Ducks sometime soon.